The Vashon Chamber of Commerce website gets an average of 6000 unique visitors a month! Sponsor and support a valuable island resource. 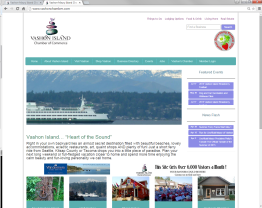 For many visitors to the Island, the Vashon Chamber Website is their first introduction to the Island. Visitors plan their trips, find lodging and scope out where to eat, shop and play when they get to the Island. Locals use the site too! 48% of site users are Island locals who visit the site to get information about the businesses and activities on the Island. The most popular features of the website for locals are the Calendar, Specific Event Pages, the Island Business Directory Search, and Strawberry Festival Pages. Also seasonal pages about events like Halloween, WinterFest, and Shop Vashon are very popular. FRONT PAGE SPONSOR: ($100.00 Mo. 3 Mo. Min) Every visitor starts with our front page. As a FRONT PAGE SPONSOR your banner ad will be in rotation with only 4 others in a prime location on the front page of the site. With only 5 of these sponsorships available your support will be clearly acknowledged and your banner ad will stand out. CALENDAR/EVENTS PAGES SPONSOR:($50.00 Mo 3 Mo. Min) One of the most used features of the website. Your banner would be one of 5 rotating banner ads that appear on the Calendar Page as well as on every individual event page. BUSINESS DIRECTORY/SEARCH RESULTS SPONSOR: ($50 Mo. 3 Mo. Min) Many people search for local businesses with our Business Directory. We try to list every business and organization on the Island regardless of Chamber Membership so that people can find them. Be one of 5 rotating banners on the business directory page and on non-category specific search results pages. CATEGORY SPONSOR: ($20 Mo. 3 Mo. Min) You can sponsor a specific category and be one of 5 rotating banners for your industry category or any other category you want, exlcuding quick link categories described above. There is no category exclusivity and is different from quick link categories. We have over 40 different categories and will work with you which one is the best fit for you. We will work with you to maximize your sponsorship benefits.